A broken boat forced cancellation of an annual measurement of the Gulf Coast Dead Zone for the first time in nearly three decades, despite early estimates that the oxygen starved area is growing. Early estimates put the dead zone, an area of depleted oxygen that forces sea life to swim away or suffocate and die, even larger than last year. 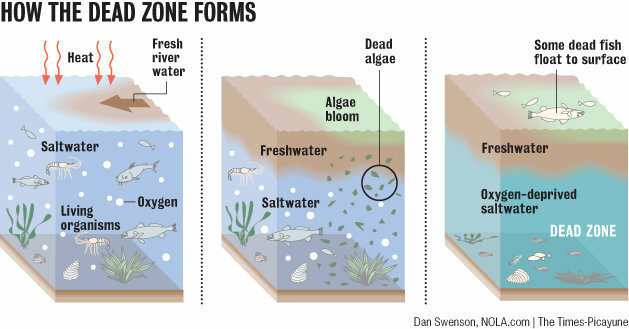 Since 1985, Louisiana Universities Marine Consortium has conducted an annual measurement of the size of the Dead Zone, an area of hypoxia that forms each year in the Gulf of Mexico as a result of nitrogen and phosphorus pollution flowing down the Mississippi River. This year, NOAA stipulated that LUMCON must use a NOAA research boat as a condition of funding the expedition. The boat broke down and on July 29, NOAA announced the cancellation for the first time in 27 years, despite issuing a dire projection of its size earlier in the summer. This malfunction and subsequent cancellation comes only a year after the EPA’s Gulf Hypoxia Task Force admitted it was nowhere near its 2015 goal of reducing the Dead Zone to less than 2,000 square miles. Instead, early estimates indicated the 2016 Dead Zone would have been even bigger than last year at approximately 6,824 square miles. A 2009 report from the Office of Inspector General found that Arkansas adds about 7% of the total nitrogen and 10% of the total phosphorus to the Gulf of Mexico. Many Arkansans experience negative impacts from excessive nutrients in our waterways leading to foul smelling drinking water and recreational areas being closed due to public health concerns from high algae levels. The effects of nitrogen and phosphorus pollution are being felt across the nation this summer, most recently with the ecological disaster in the Everglades. Similar pollution has been responsible for contamination of Des Moines and Toledo drinking water supplies, the annual closure of beaches across the nation, countless human illnesses, and even the deaths of dogs that swim in it. The pollution causing the Dead Zone comes from various sources, from urban run-off to the discharges from sewage treatment plants and industrial facilities. However, agriculture has been identified as the largest source of Dead Zone-causing pollution in Mississippi River states all the way down to the Gulf. Still, there are virtually no standards that the agriculture industry must meet to address these problems. The 2014 Arkansas Water Plan Update recommends the State require nutrient management plans statewide for the application of poultry litter and animal manure. Nutrient management plans help landowners and operators achieve maximum soil fertility while protecting state waters. Currently such plans are required only in the “Nutrient Surplus Area” which was designated by the Arkansas General Assembly and consists of watersheds on the western and northern borders of the State. Similar to many recommendations in the Arkansas Water Plan, requiring nutrient management plans statewide will require state agency and legislative action. The Arkansas Public Policy Panel and members of the Mississippi River Collaborative continue to push the EPA and states to set pollution limits for nitrogen and phosphorus necessary to restore clean water in the Gulf of Mexico and throughout the Mississippi River Basin.